CAN YOU HEAR ME NOW? 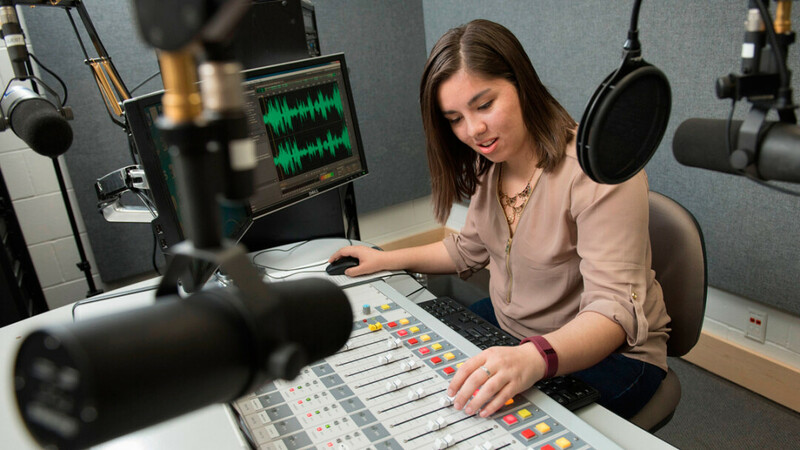 Kiri Salinas, student station manager for WUEC-FM, and her fellow Blugolds will soon have another radio station to broadcast on: What’s now known as WDRK-FM (99.9). The benefits of a recent gift to the UW-Eau Claire Foundation will be heard far and wide – literally. Midwest Family Broadcasting of Eau Claire plans to donate one of its radio stations – Federal Communications Commission license, 25,000-watt signal, 390-foot tower, and all – to the foundation, allowing UWEC students new opportunities to hone their broadcasting skills in a real-world environment. Expect plenty of student-produced news, sports, and music programming on what’s now known as WDRK-FM, said UWEC Foundation President Kimera Way. While the musical focus will be up to the students, there’s a strong desire to fill a sought-after but largely unmet niche on the local radio dial: indie rock. “We hope to become the station of choice that’s on the cutting edge with some of the music that’s happening here,” Way said. When the deal is complete, likely by the summer, WDRK-FM (99.9) will be owned and operated by Blugold Radio LLC, a subsidiary of the UWEC Foundation. The station will have new call letters (WECM – for “Eau Claire Music” – is a possibility) and will be noncommercial. While details have yet to be ironed out, the station is expected to carry student programs part of the day and Wisconsin Public Radio’s News and Classical Network at other times. Currently, UWEC students’ primary radio experience comes from a once-weekly three-hour Blugold Radio block on WUEC-FM (89.7), which is otherwise a Wisconsin Public Radio station. WDRK broadcasts from a tower near Bloomer and reaches most of the Chippewa Valley, as well as areas to the north. It’s currently branded as Greatest Hits 99.9, although until recently it was dubbed BOB FM. Between 2001 and 2009, it was known as The Carp. The donation of the station, which is valued at approximately $1 million, was both altruistic and necessary: Midwest Family Broadcasting is in the process of buying another Eau Claire-area station, The Mix 98.1 (WISM-FM). That purchase will put the company over a federal limit on the number of radio stations it can own in one market (it already owns WAXX-FM, I-94, 92.9, WAYY-AM, and Oldies 1150 AM, as well as WDRK). The tower for WISM is located on the south side of Eau Claire, giving the station a stronger signal in the heart of the Chippewa Valley, said Lynn Bieritz, Midwest Family’s general manager in Eau Claire. Once the deal is complete, the Greatest Hits format from 99.9 will shift over to 98.1. This will bring that commercial format to more ears in the Chippewa Valley while also being a boon to UWEC students by allowing them more access to the airwaves via 99.9. “I’m hoping that the community benefits from the donation of 99.9 and the new information that the students are able to broadcast and the hands-on education they can get,” Bieritz said. Students such as journalism major Kiri Salinas looking forward to getting on the air in a new way, too. “I was thrilled. We only have three hours once a week,” said Salinas, student station manager for WUEC. “It opens up so many doors for us as an organization and a radio station.” Many students are particularly interested in the expanded opportunity to play music, she said, adding that she’s heard buzz from would-be DJs who want to play everything from international metal to show tunes to indie rock. Having more broadcast time will also allow the opportunity for call-in shows and play-by-play of Blugold sporting events, she added. The donation will also benefit Wisconsin Public Radio, explained regional manager Dean Kallenbach. WPR will provide engineering assistance, although the station will use a studio in Hibbard Hall on campus and will be owned by Blugold Radio, not WPR. Because of the location of the station’s tower, it will fill gaps in WPR’s statewide coverage, particularly in Barron and Rusk counties. Kallenbach already works with students to create the current “Blugold Radio” program, and noted that the broadcast won an award last year from the Wisconsin Broadcasters Association for best student newscast.